Within the range of possibilities of any given moment, there lives a state of enchantment – the chance to find and follow our bliss. When I work in my studio, that is the place where I reside. I continue to explore many media for my work. Canvas, paper, paint, wood, mild steel and felted wool all make their home in my art. While this eclecticism exists with media, the sources of my inspiration remain the same. My infatuation with nature and my love of colour, as well as my obsession with the organic line are evident. Curves, vines, trees, flowers, and spirals all grace my work. Their soft lines pull the eye and create restfulness, even when the picture may have a very bright colour scheme. My work is mainly about joy and beauty, but once in a while, a piece will reach back out to me as I am creating and take on a life of its own. At those times, themes of feminism or the environment may emerge, as well as thoughts of where we come from and where we are going. Brenda Isaak Takao is a multi-media artist who was born and raised in Coaldale, Alberta, Canada. Recently, she and her husband have moved to the beautiful Vancouver Island. While in university, Brenda’s minor was art, and she also has a diploma in interior design for which she earned the Governor General’s Collegiate Bronze medal. Born in 1970, she displayed an early aptitude for drawing and has a vague memory of her mother furiously scrubbing her artwork off the walls. 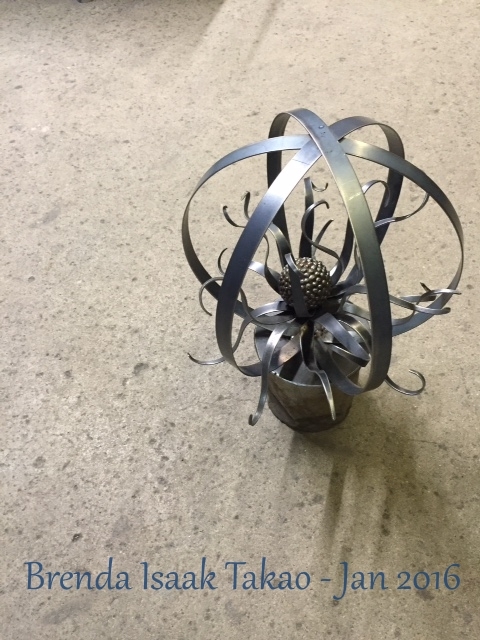 She has dabbled in watercolours, acrylics, metal sculpture and even into more functional metal works as she has inexplicably turned into a journeyman welder somewhere along the line. More recently, mixed media and surface design have made their way into her artwork, as well. “Beauty, to me, is an essential part of living. We crave to be surrounded buy it, and to create it in our lives.